The shoulder joint is the most frequently dislocated major joint of the body. Dislocations typically occur when an impact causes an abduction or extreme rotation and the head of the upper arm bone (the humerus) pops out of the socket. A subluxation is a partial dislocation. 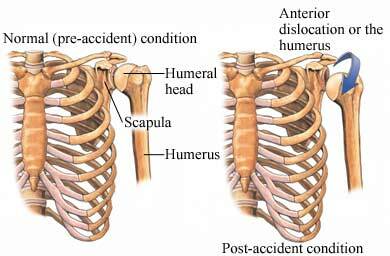 The shoulder can dislocate in any direction. Pain is intense and common. Swelling, numbness, and weakness soon follow. It's diagnosed with a physical exam and x-rays to rule out a fracture. Doctors replace the ball of the humerus into the joint by a procedure called reduction. The arm is put in a sling or a shoulder immobilizer for several weeks. After pain and swelling decreases physical therapy is started to restore the range of motion of the shoulder and strengthen the muscles. A dislocated shoulder make an athlete more likely to have another injury, because ligaments may be stretched.